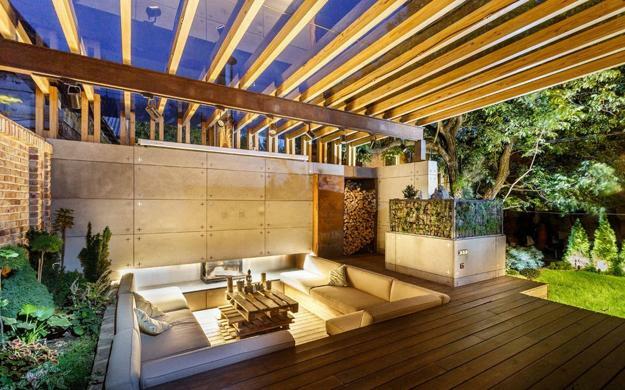 Comfortable outdoor seating areas are fantastic additions to modern homes. Private and beautiful backyard designs offer fabulous places for entertaining and relaxation, while the elegant, exclusive idea of an open air home theater adds luxury and originality to yard landscaping. Even a small seating area can be comfortable, cozy, and modern. 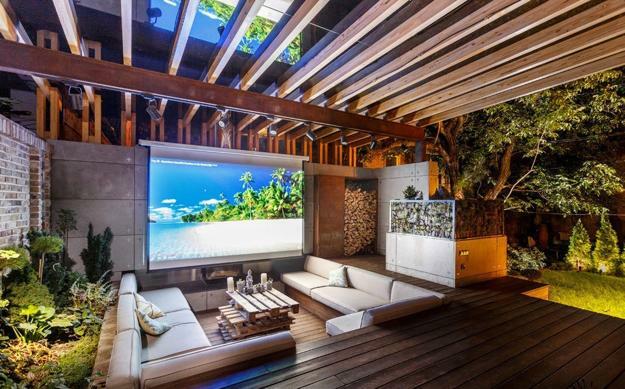 Lushome brings an exclusive patio design with the outdoor home theater, soft sofas around a fireplace. 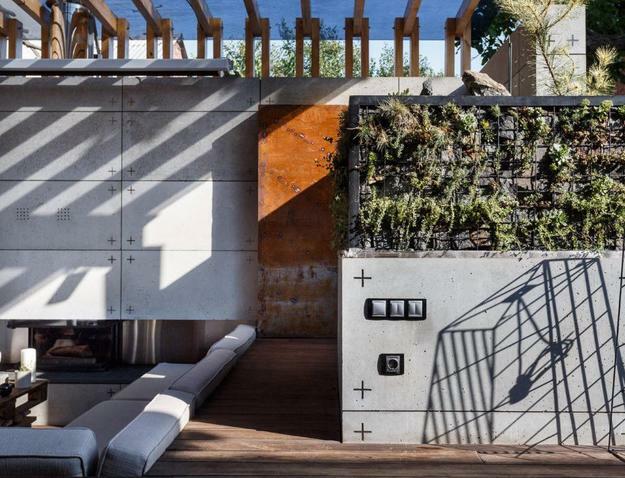 The open air home theater and elegant BBQ area create this magnificent backyard with gorgeous vertical gardens and flower beds. It is a beautiful example of comfortable and chic yard landscaping and patio design creating a private and cozy outdoor seating area which is spectacular and multifunctional. 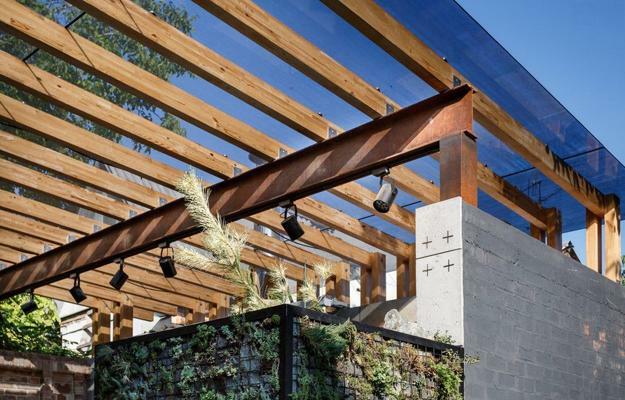 The private courtyard blends traditional yard landscaping ideas with elements of an industrial style, mixing Courteous steel, concrete and metal wire with traditional bricks, wood, plants, and flowers. 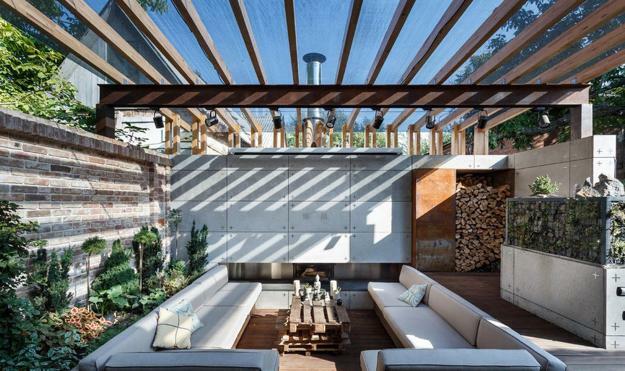 The fabulous combination of materials is an example of an extraordinary, novel and unique approach to small backyard designs. The structural elements and industrial style details create an organic blend of traditional building materials and stylish alternatives. Metal bars hold a wooden canopy. The sofas offer comfortable seats around a fireplace, and the removable back and seat cushions allow rearranging the outdoor seating area into a home theater providing comfortable seats for a big party and emphasizing the multifunctional backyard design. Flexible, comfortable, and space-saving patio design is a very functional approach to small spaces. 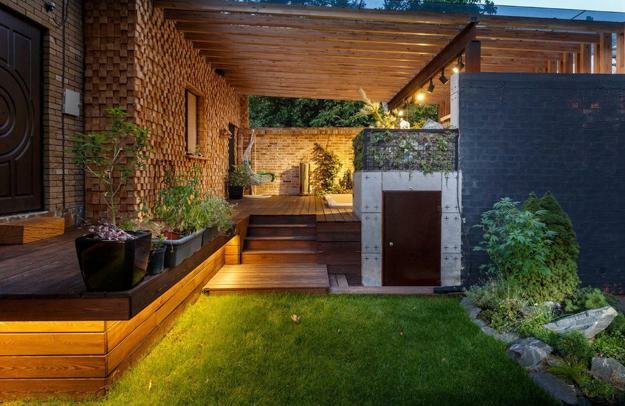 The brick fence increases privacy, while a concrete slab wall hides the chimney of the outdoor fireplace. An artificial glass roof protects the home theater from rain while allowing plenty of sunshine to brighten up the outdoor seating area. 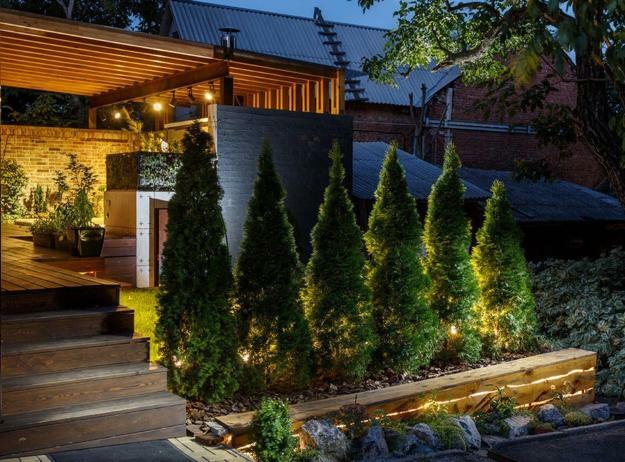 Creative lighting design illuminates different areas, changing a mood and brightening up the patio garden, outdoor seating area or a fireplace. 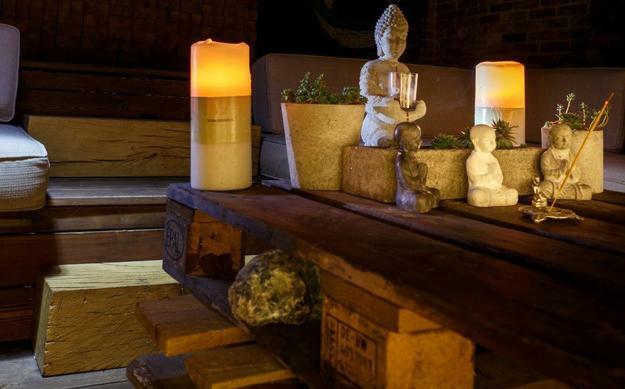 Three wooden pallets create an original and stylish coffee table which shows creative 3-in-1 design. Three little coffee tables on top of each other are a convenient, functional, and space-saving solution for small spaces, perfect for everyday relaxation, large family gatherings, and big backyard parties. Green plants create a beautiful fence which softens the concrete and metal patio design under a canopy in an industrial style. Green walls and flower beds create an ambiance of an oasis, bringing freshness into the desert backyard. Yard decorations in Asian style just increase an original, unique, and exotic feel. The beautiful patio ideas mix various plants, wood, metal, bricks, plastic, and concrete adding a contemporary style to the outdoor seating area. Creative and attractive blends of plants, flowers, and landscaping rocks add originality to outdoor home spaces and create harmonious and welcoming patio design.